Add the finishing touch to your home decor with this throw pillow from Pillow Perfect. 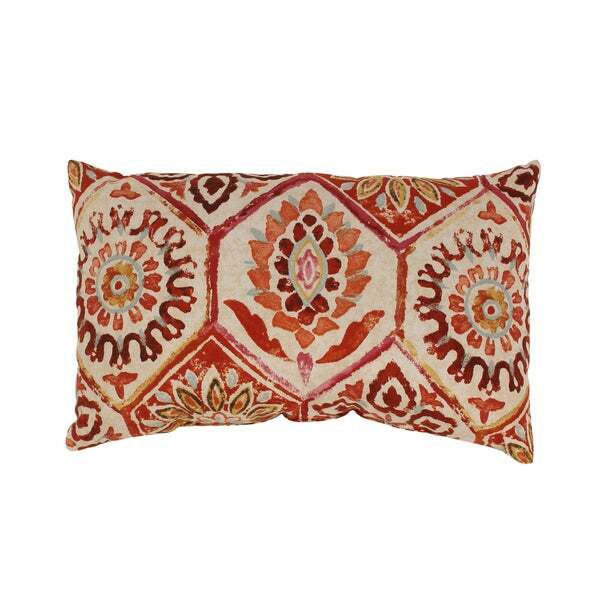 This pillow has an eye-catching design that will highlight your home decor. I bought this one with " Safavieh Leary Washed Natural Bench" , "Thea 20 -inch taupe /gold decorative pillows" & Damask 22 inch beige/ blue decorative pillows. It's really much and I love these! Looks very summerly! Nice little pillow, a little steep in price for the quality. Cover not removable, as described. I like them, and the colors are perfect for my home, which has reds and corals. This is such a call of a little pillow. I love it! It goes well with my new decor and as a pop of color to my new room. Ordered different sizes, they are all bright and colorful and really lighten up my brown couch. Love them. I love these pillows! I ordered two to accent dark red leather chairs and they create a whole new look for these chairs. They really bring the room they are in to life. These pillows are very soft and work great as lumbar pillows too. Design looks painted on. Will use as an outdoor pillow as it's too expensive to return. "Can someone please tell me if there is aqua in the pillow. It looks like it, but I would appreciate a confirmation. Thanks!" Hello pat46, we try to represent the colors of our products accurately. Unfortunately, due to the difference in monitor colors we cannot guarantee that the color will match exactly what you see on your screen. Thank you for shopping with us. I have been looking at these pillows and colors for a long time, I hope I am not disappointed.